Bynder is a leading Digital Asset Management Platform—a B2B software solution that provides businesses the ability to create, organize, and store their digital content in the cloud. With a 2018 growth rate of 140% and acquisition of competitor Webdam, finding a scalable BI platform was critical to fueling their pace of growth with actionable business insights and fostering a data-driven organizational culture as internal teams expand. Spearheaded by John Fenton, then Head of BI, Sisense was selected late in the buying journey when it became apparent how much manual data preparation competing solutions would require. Sisense’s Single–Stack™ Solution was quickly identified as the only option for mashing up disparate data and meeting Bynder’s goal of empowering data-driven employees with insights for all. Most BI platforms do the same thing, but everything is so much easier and quicker with Sisense. The Challenge: A single source of truth—down with manual reporting! More than 250,000 brand managers, marketers, and creatives use Bynder’s brand portals every day to collaborate globally, produce, review, and approve new marketing collateral and circulate company content at the click of a button. Brands using Bynder’s digital asset management solution go to market faster and achieve end-to-end brand consistency across all channels and regions, with simplified collaboration across the organization. Bynder is growing fast, and John was overwhelmed by requests to create analytics reports that could drive key decision-making processes. But without a BI solution that provided a single source of truth, he found himself creating the same reports over and over again. Operational data was scattered and stored haphazardly across the organization—in Salesforce, Google Sheets, and Klipfolio. John knew he was sending reports that were never read, he lacked a centralized repository for the reports he created, and he had no way to see what people were actually using. The right BI platform for Bynder would have to handle large amounts of operational data, translate that data into insights, and make those insights accessible and actionable to Bynder’s business users. When evaluating Sisense, John joined the procurement process and Bynder was close to choosing another BI platform. However, when he came across reviews of Sisense on G2 Crowd, he was intrigued by the promise of a full-stack solution that required little manual data preparation and completely automated the process of ETL. 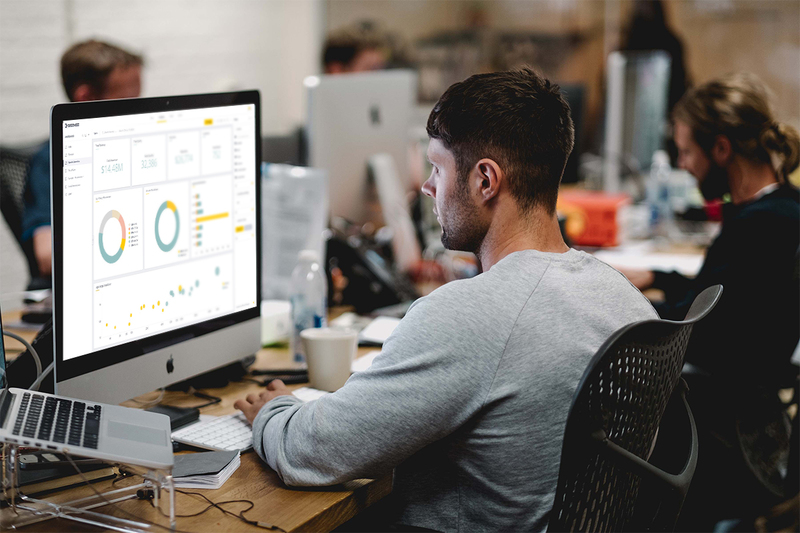 The Sisense BI Implementation Methodology empowered Bynder to get their dashboards up and running with minimal support requests and the dashboards are a hit. With Bynder’s data sources connected to Sisense, it’s easy to tweak and iterate dashboards as requests come up. Bynder employees have come to depend on these dashboards as part of their day-to-day business processes—and everybody wins. The operations team is empowered to swiftly implement the changes that business users request and business users are empowered with accessible, actionable insights—no report requests required. Executive dashboards measure performance by quarter and pipeline. Product dashboards measure attachment rates of Bynder modules and what sells best by region. A sales dashboard measures performance by sales representative and sales reps each have an individual dashboard they use to discuss their performance during periodic reviews. And the demand for Sisense dashboards is contagious—cue the dashboard envy! The next dashboards in the pipeline include marketing dashboards for the Demand Gen team and performance dashboards for the CSM team. The demand for Sisense dashboards is contagious—cue the dashboard envy! The quarter following Sisense implementation saw a 15% increase in Bynder’s sales pipeline, for which John credits the data transparency fueled by Sisense. Sales dashboards are circulated frequently and sales reps know that their achievements are visible to the entire team. In 2019, John looks forward to making data even more visible around the Bynder offices and continuing to nurture the data-driven company culture he’s fostering with Sisense.